We were seven intrepid hikers this morning, meeting at 6:30 a.m. to complete our coastal tour. Today’s hike started where the Poleg Stream empties in the sea. Or doesn’t. 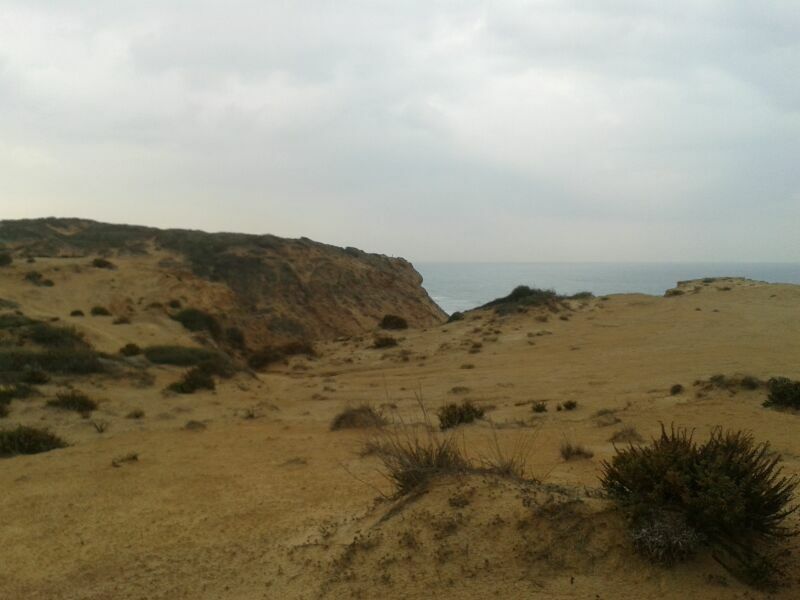 In fact, this small coastal stream only flows into the Mediterranean during the winter months. Like the Yarkon and the Alexander Streams, the Poleg originates in the mountains and has been very polluted. On its journey to the sea, the stream collects debris and waste from cities, villages and farms all the way from the West bank. The naturalists want to keep this as a nature preserve, which will help protect the green and loggerhead sea turtles who come to this area to nest and lay eggs. In the winter, when the stream flows into the sea, grey mullet swim upstream to spawn. 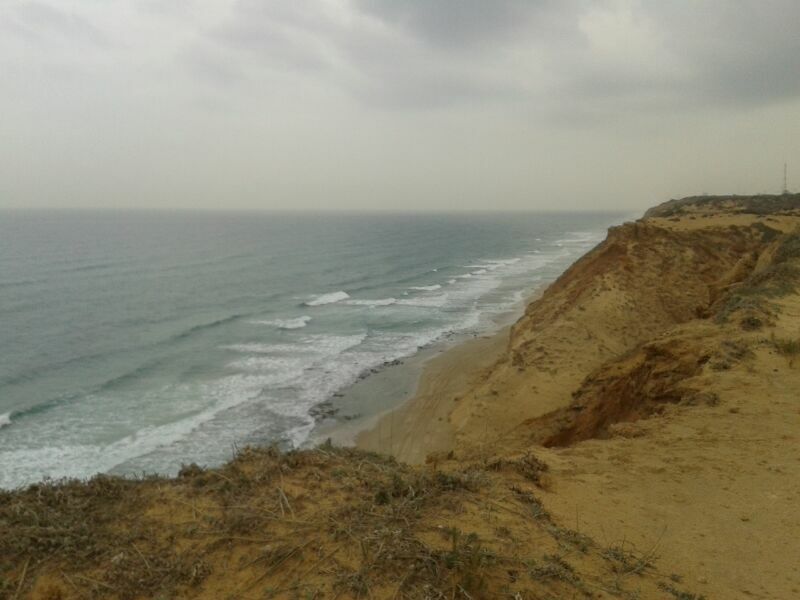 However, developers and the Netanya Municipality have been fighting to turn this estuary into a marina and hotel resort area. Environmental groups are fighting this and the decision is on hold for now. Having hiked through this oasis, we hope this natural gem will remain protected forever. 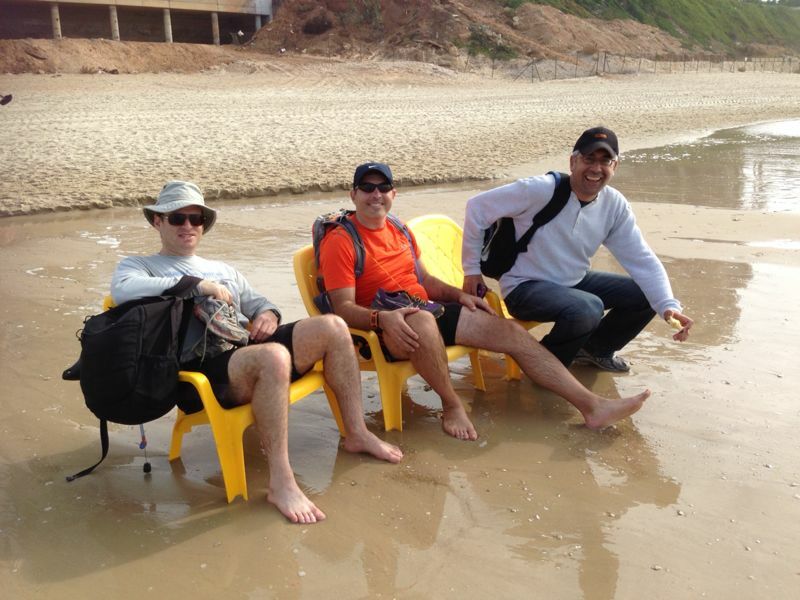 When we started our hike, we imagined we would be walking right along the coast. But our first blaze indicated that we were to go inland. We followed the stream and walked under Highway 2. Confused, we did lose the trail at one point, but were excited to come across a gas station with restrooms and strong espresso—and right outside, we found a reassuring Israel Trail blaze which took us back across the highway in the direction of the sea. 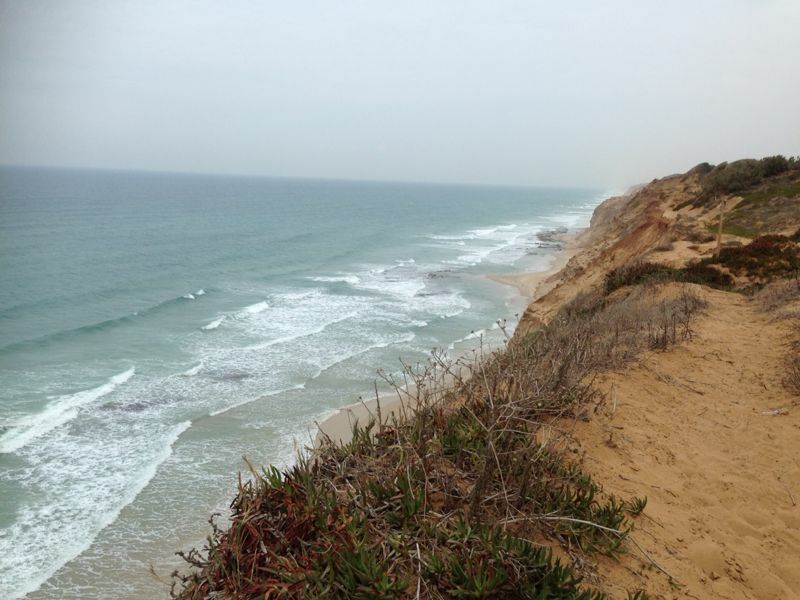 We hiked back to the coast and followed winding trails across soft sandy dunes. 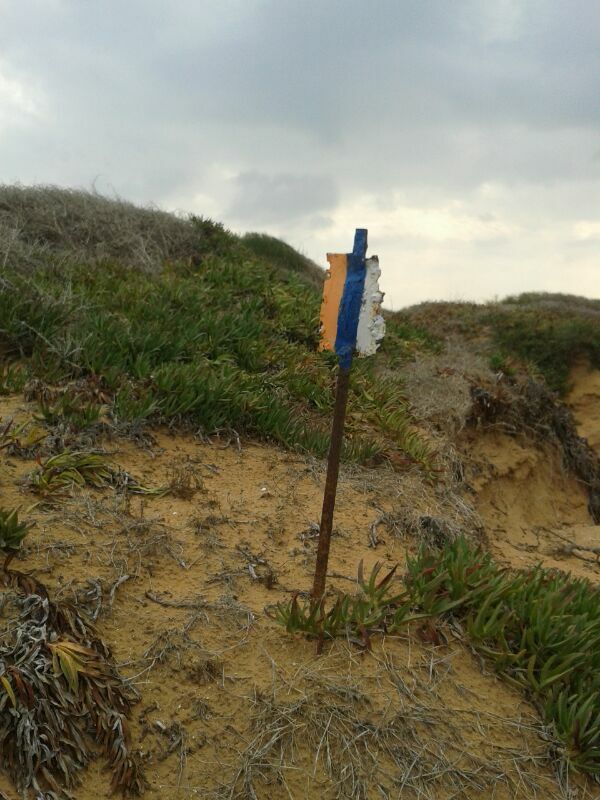 This was the Sha’ar Poleg Nature Reserve. This area is the rare habitat for many plants including the dark purple iris which blooms in February. 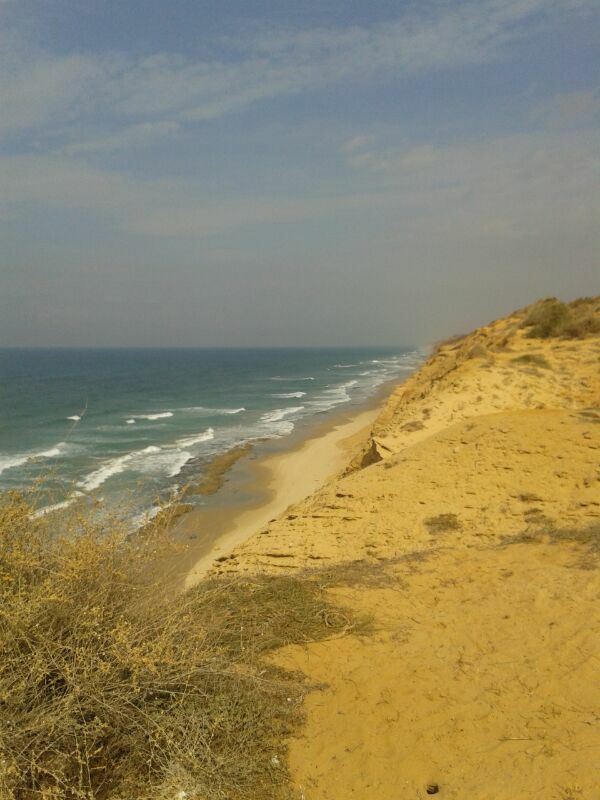 This coastal promontory was deemed a nature preserve to protect the area from the hands of real estate developers and is an idyllic retreat in a very populated part of Israel. The reserve extends from the Wingate Institute to Rishpon and is 1200 meters long and 400 meters wide. Typical desert plants that grow here include white broom, Artemisia, sea squill and Israeli thyme. A small area with a wooden bench atop the cliffs was a perfect place to unwind, eat and enjoy the view and the soft warmth of the November sun. 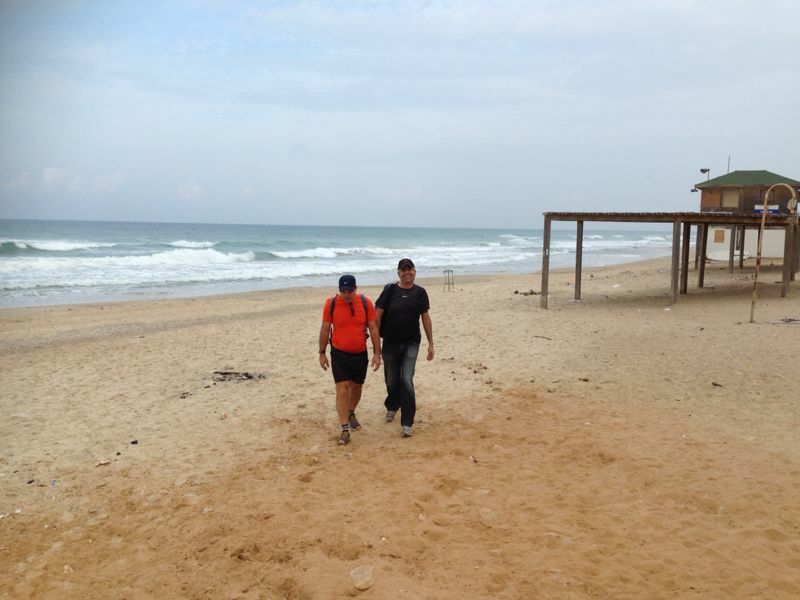 We then followed the dunes until we exited the area in the upscale residential neighborhood of Shefayim. There we followed a road and some fields until we reached Apollonia where we followed the path onto the soft sand, took off our shoes and walked the length of the beach barefoot. 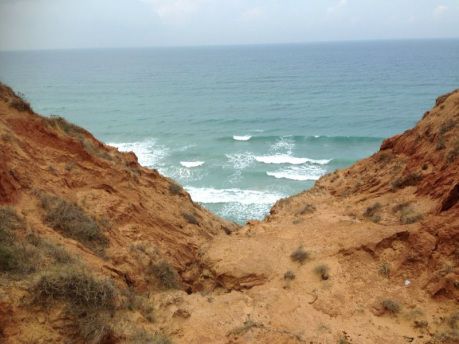 We left the wild untamed beach and soon arrived at the fancy hotels, outdoor cafes and beach bars of upscale Herzliya Pituach. 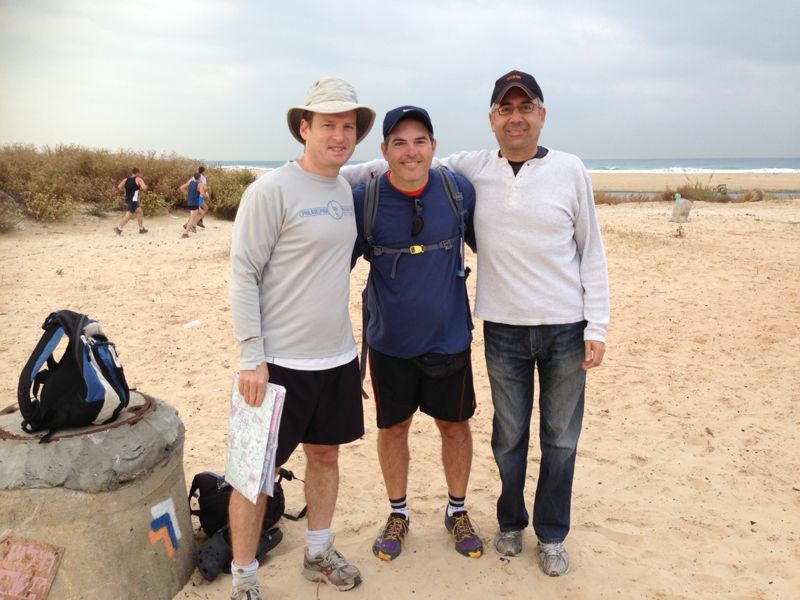 We finished at the Arena Mall, completing 19 kilometers of the beautiful, diverse Israel Trail.